Synbiont Kennel Wash helps to control deadly viruses like canine parvovirus, as well as bacteria and fungus that can easily be transferred from the dog park, footpaths, shows and trials to your home. The outbreak of a contagious disease can give a facility a bad name. It can take years of being ‘break out free’ for facilities to earn the trust of clients, associations, and competitors again. Forward thinking facilities and those concerned about their future bottom line, use Synbiont Ag Wash to help secure future shows and to keep their good name. Why Do I Need To Worry About Bacteria At My Dog Kennel Or Dog Business? 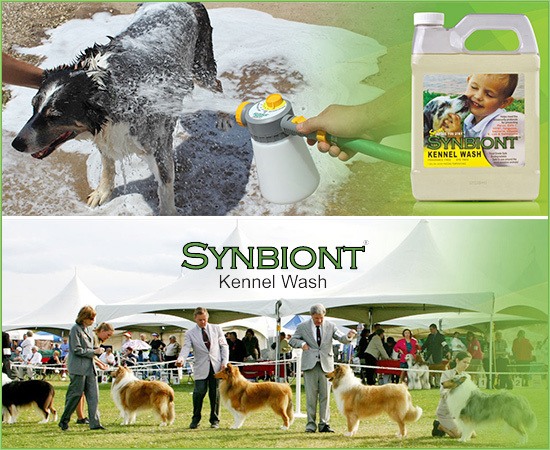 Applying Synbiont Kennel Wash is a critical, proactive step toward creating your own biosecurity protocol for cleaning your business, your home, your animals, their pens, travel carriers and helping prevent exposure to deadly diseases. Creating a protective, animal-safe barrier against e.coli, salmonella, staph and other diseases whether at your facility, home or on the road cannot be ignored. Avoid exposing your business or your animals to other’s negligence – “Spray before you Stay”. But Can't I Just Use Bleach Or Hydrogen Peroxide And Get The Same Effect? Most of the chemical products on the market today are very dangerous and toxic. In most cases, these harmful sanitizers cannot be applied directly to your animals; there are severe re-entry limitations and only work one time. Also, most disinfecting products can irritate the skin, eyes and respiratory system when applying. Is It True My Dog Doesn't Have To Leave The Kennel While It Is Applied? Correct. There are no re-entry limitations for humans or your horse. Not only can the horse be in the stall during application, there is no harm in the product getting into feeding and water troughs and is safe if licked. Is It Safe and Non-Toxic-- Even When Freshly Applied? Yes, Synbiont Kennel Wash is a patented, proprietary blend of EPA approved and FDA certified surfactants- alkyl sulfonate and an alkyl sulfate. These anionic surfactants have high water solubility and are highly active at low concentrations; these negatively charged molecules provide a superior clean thanks to their unique penetrating abilities. Can I Re-activate The Coating In A Few Days By Putting A Fine Mist of Water Over the Kennel or Applied Areas? Yes, Synbiont Kennel Wash remains surface active even though the product is not visible. Normal activity is between 7-21 days and with a fresh application of water, the product will slightly foam and continue to work over time. This continued activity helps to provide a protective barrier to your animal and their surroundings. Is It True That Symbiont Can Destroy Even Parvo And Other Powerful Bacteria? Almost half of the dogs that contract parvo don’t survive. This easily spread disease survives freezing temperatures and can live for months in a dog’s environment, ultimately being spread via feces. Synbiont Kennel Wash, as instructed on the label, can provide both a maintenance and eradication step for the parvovirus. Can I Use Synbiont On My Dogs's Coat For Fungal Problems or Wounds? Absolutely. Washing your dog with Synbiont Kennel Wash will help reduce fungal issues such as hot spots, ringworm and mange just to name a few. Like a shampoo, the properties of the product are both safe to apply to your animal and helps clean, but unlike a shampoo – it offers a significant layer of protection and bacterial control. This process of cleaning and removing the bacteria, helps to improve wound cleanliness and enhances recovery time. Can I Really Buy 1 Gallon and Turn It Into 55 Gallons Of Effective Treatment? 1 gallon of Synbiont Ag Wash should be diluted to a 1:50 ratio (or 2.5oz of product per gallon of water). This dilution rate creates 50 gallons of usable wash. A few application methods include: pump up sprayers, hose-end sprayers and pressure washers. How Long Does Synbiont Last Once I Mix It With Water? There are no expiration limitations on concentrated or diluted product. What Do Users Say About Synbiont? The South Point Equestrian Center in Las Vegas is premier facility for horse and animal shows of every variety. In 2012, South Point incorporated Synbiont Ag Wash in to its biosecurity protocols. Every stall at the South Point Equestrian Center is drenched with Synbiont prior to the arrival of another animal. Congratulations South Point for being proactive in the fight against communicable disease. Tulsa Expo Square began using Synbiont Ag Wash to drench stalls in May 2012 prior to the start of the National Cutting Horse Association endorsed show, The Breeder’s Invitational. Cutters, worried about outbreaks of EHV-1 that had wrecked havoc in the industry just 12 months, were outspokenly thankful to management for introducing SynBioNt to their biosecurity protocols. Tulsa Expo Square will continue to use Synbiont Ag Wash at every equine show for the rest of 2012.